Despite the risk factors outlined in Supplement 411, USADA understands that some athletes will decide that they still need or want to use dietary supplements. For those who choose to discount the risks or have determined that dietary supplements are still necessary, there are steps athletes can take that may reduce the risk they face, to some degree. The steps outlined in this section center around research, awareness, thoughtful questioning, and becoming as fully informed as possible. 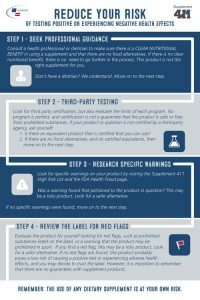 Remember, following these steps will not eliminate the risk involved with taking dietary supplements; the aim is to only help reduce the risk as much as possible. It is possible that an athlete can follow every one of these steps and still test positive for a prohibited substance or fall victim to negative health effects. The only way for an athlete to completely eliminate the risks associated with dietary supplements is to avoid dietary supplement use all together. Use the following steps to reduce your risk of testing positive or experiencing adverse health effects. In the event that the use of a dietary supplement causes a harmful side effect, you can report serious problems to the U.S. Food and Drug Administration. Consult a health professional or dietitian to make sure there is a CLEAR NUTRITIONAL BENEFIT in using a supplement and that there are no food alternatives. – No clear nutritional benefit? No need to go further in the process. For more information on food alternatives and how to fuel your sport performance, see the USADA Nutrition Guide. – Don’t have a dietitian? We understand. Move on to the next step. Learn more about consulting and working with a Sports Dietitian. Look for third-party certification, but also evaluate the limits of each program. No program is perfect, and certification is not a guarantee that the product is safe or free from prohibited substances. 1) Is there an equivalent product that is certified that you can use? 2) If there are no food alternatives, and no certified equivalents, then move on to the next step. Look for specific warnings on your product by visiting the Supplement 411 High Risk List and the FDA Health Fraud page. – Did you find a warning that pertained to the product in question? This may be a risky product. Look for a safer alternative. – No specific warnings found? Move on to the next step. Evaluate your product by looking for red flags, such as the ones listed below, or use the Red Flag Checklist. If one or more red flags are found, it may mean the product is risky. – There are prohibited substances listed on the label. – The product is in the bodybuilding, weight loss, pre-workout/energy, or sexual enhancement categories. – There is a warning that the product may be banned in some sports, or there is a health warning. – The product advertises to treat or cure a disease (e.g. the common cold, diabetes, arthritis). – The product advertises to be “all natural” but to have the same effects as a prohibited substance (e.g. testosterone, steroids, growth hormone, IGF-1 or EPO). – The product advertises to be approved by USADA or the World Anti-Doping Agency. – The product lists a proprietary blend, or the product has trademarked ingredients but you can’t find good information about the ingredient. 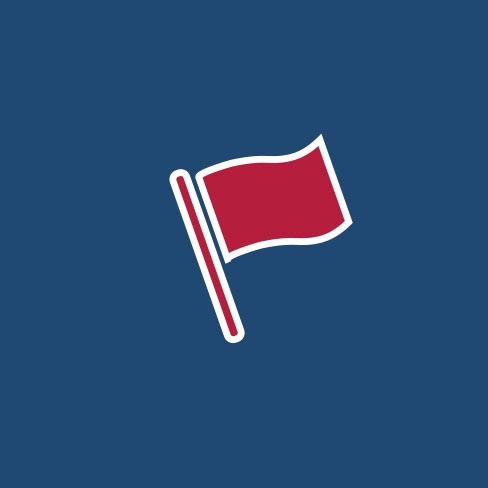 Did you find a red flag? This may be a risky product. Look for a safer alternative. No red flags found? This product probably poses a low-risk of causing a positive test or experiencing adverse health effects, and you may decide to trust the label. However, it is important to remember that there are no guarantees with supplement products. "The fact that I know that USADA is there to protect the integrity of sport, and my sport in particular, it's just a really comforting feeling." - Two-time Paralympian and U.S. Wheelchair Basketball team member Steve Serio. Check out more from Steve on clean sport and innovation in anti-doping at the link!